Whew… it’s been an exciting and busy couple of weeks on the PlayStation Network. Last week we shared the news that NHL will begin streaming live games to the PlayStation 3 and that Hulu Plus is now available to all PlayStation Network members and we’re not slowing down! I’m happy to report that beginning next week, VUDU, the HD movie streaming service, will be available to all PS3 users in the United States that are registered to PSN, making it the only gaming console to offer VUDU. With VUDU, we’re adding another layer of great entertainment content to PlayStation Network and providing another choice for PS3 users to experience cinema-quality entertainment in the comfort of their living rooms. Access to VUDU doesn’t require a subscription. Simply pay-as-you-go for the content you want. All of you with a free PlayStation Network account can get in on the VUDU action. Simply go to the PlayStation Store and download the VUDU app for free. Once you’ve downloaded the app, you’ll see it appear in the XMB under the “Video” icon and from there, will have access to thousands of movie titles – available for instant viewing in HD and HDX 1080p formats with no buffering or downloading, and with Dolby Digital Plus 5.1 Surround Sound. Many of the hit movies are available for rental or purchase right when they are released to DVD and Blu-ray, giving you the most instant access when you want it. You can recommend movies for your friends to watch using its social network integrations or just peruse VUDU’s video store and discover what’s available. It’s quite simple. Check it out! Once again, Canada is completely ignored and forgotten. It’s like we don’t exist. Correct me if I’m wrong, but wouldn’t Hulu, VUDU, Netflix, and the Store all be competing for purchases of the same content on each and every PS3? Let me guess.. the catch is that its US only isnt it? It Only Does Everything! Don’t let up Sony! What is this…? I’ve never heard of VUDU before. BUT THIS SOUNDS AMAZING! As long as the video is moderately priced since there is no subscription fee, it sounds like it could be a true competitor to Netflix. Again…. there is no outer world outside United States… Latin America, Canada, Mexico…. etc we dont exist but we all pay USD$ 300+ for a PS3 but it looks like they never received our money because they don’t share any of these services with anyone else instead of US citizens. Options are always nice. Instant streaming is a definite plus! Nice now I will impulse spend even more. Isn’t this video service cannibalizing on Sony’s current PSN video service? WOW everything its always paying lol! why not give us a service where we can subscribe for free and watch movies online free? I think all of these services (Hulu, Netflix, VUDU, etc.) should integrate with the PSN’s wallet so we don’t have to whip out the credit card to pay when we have funds on the PSN anyways. *CANADIANS* Go on and try and use Vudu on any other device in Canada.. Oh wait you can’t. So until the service is available in your country you are not going to be able to anything about it and neither is Sony. Loving the constant stream of new PSN features. Go Sony! Very nice. I love all the updates, disc-less Netflix, Hulu, NHL, now this. As well as DVD and Blu Ray, you really get alot of choices. While this is great for the user, wouldn’t this perhaps take out of sales from movies on PSN? @12 Cause it’s not Sony’s service, and they don’t control the subscription prices. Man, honestly people like you make me wish for a disable comments button. @Dehshizknight – that’s actually a pretty slick rick idea, submit it to share! Awesome. So day and date with dvd/bd releases, huh? Take that, Netflix! Sony doesn’t control when Netflix/Vudu(Walmart)/HULU come to another country…IT HAS NOTHING TO DO WITH THEM. On the other hand…Sony…stop charging for NFB films on PSN store in Canada when they stream from the NFB website for free please. @4 Blame the CRTC. These companies all want your money. The problem is, the CRTC is in the pockets of the traditional cable companies, which are a huge scam. They don’t like these cheaper, better services competing, therefore, the CRTC throws a wrench in the gears. Is this better than having the netflix account? Does the service provide close caption or subtitles? @23…it is absolutely NOT the CRTC. The licesning for movies and TV shows has already been sold into Canada to the likes of Alliance and CTV etc…for a digital distribution network you need to cut deals with them…again it has NOTHING to do with CRTC…at all. Do the movies feature subtitles? At this time, only non-English movies have subtitles. We do not feature subtitles on movies where the English language is spoken. lol i love the Canadians on these boards, you guys make my day fulfilled! Sony don’t stop! Having all these options are great! 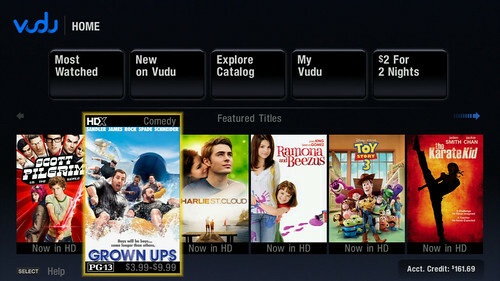 I previously beta tested the Vudu box and service and thought it was great. Unfortunately, I never purchased a box once my testing was over with. Having this come to my PS3 is just amazing. I hope Google TV is next! Canadian people need to stop complaining. Of course Hulu, Netflix, and VUDU start out as U.S. only services – that’s where their companies are based, and it’s ungodly expensive to secure international rights to content. So it takes a little longer to expand. Securing the rights to each individual movie in each individual company (a different contract for each) doesn’t happen overnight. Be patient. Now where the heck is MUBI, SCEA? This is cool, but I just don’t get it. Why keep adding competitors to their own video store?? @34…all I can see is that Walmart will advertise the heck out of VUDU now that they own it and if PS3 has struck an exclusivity deal with them you know which console will get pushed front and center at your local Walmart right? @35…Yeah, but they’ve got a lot invested in their video store, and “front shelf preference” is a whisper compared to the investment in their store. I’m sure there’s a valid business reason, but I’d love to hear what it is! So is that “$2 for 2 nights” for all movies? That’s not a bad price. But since it wasn’t really stated, I guess we can’t count on that price can we? Suhweet! Looking forward to this. Awesome, thanks sony! Any news on that Qriocity music service? Once that hits I’ll be a VERY happy camper. Just went to the VUDU website and it’s far too expensive. Not a deal at all. That’s not good. No extra charge per movie for streaming, although the new release collection is not as vast. But then all you do is put the movie on Q list. Also, do the movie studios not realize ppl are getting their movies from the internet for far cheaper prices, even FREE? Not a good move on their part. Not a good move, at all. That’s not good. At N-E-T-F-L-I-X, there is No extra charge per movie for streaming, although the new release collection is not as vast. But then all you do is put the movie on Q list. People need to understand its giving us choices, provided in different ways… i’m all for it! Keep it up Susan!